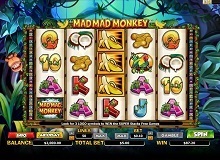 Mad Mad Monkey is a fascinating animal-themed virtual slot by Sydney based gambling software provider, NextGen Gaming. The setting comprises of visually striking icons positioned on white reels, and a green jungle in the background to complete the wild atmosphere. You’ll also notice that the symbols are wrapped in vines. The RTP of this gaming machine is 95.40%. The highlights of the game include a money-spinning free spins round which comes with stacked symbols and bonus multipliers, and a jackpot prize worth 400x your total bet. You can play Mad Mad Monkey for real money in casinos online to discover the hidden treasures of the jungle. Mad Mad Monkey game plays over 5 reels, 4 rows, and a total of 50 play lines. The paytable features 12 symbols. 10 of these icons are standard characters and they can only form winning combinations by themselves. They include Bananas, Parrot, Snake, Coconut, Cashew Nuts, and regular poker card values A, K, Q, J, and 10. Wild Monkey: this is the wild card in the game and it can substitute any other symbol to form a winning combination, except the scatter. Choose your stake for each line by sliding the cursor along the horizontal bar indicated by the coins. You can stake as little as €0.01 per line or as much as €0.50, which translates to a maximum total bet is €25. The machine also provides you with an autoplay feature which you can use to set any number of automatic rotations between 1 and 100. The aim of the game is to land a set of 3 or more similar symbols on successive reels to get paid. You can play with 50 with the maximum lines for better chances of winning. All wins start with the leftmost reel and your prize for each combination is determined by your line bet and symbol multiplier. 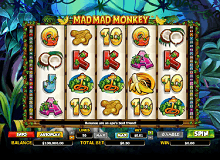 When it comes to the payouts, the banana is the most valuable standard icon in Mad Mad Monkey slot. It pays at the rate of 4x your line bet for 2-of-a-kind, 24x for a set of 3, 50x for 4-of-a-kind, and 1000x for the highest combination. It is followed by the Parrot which also awards similar amounts only that it doesn’t pay for 2-of-a-kind. J and 10 are the least valuable icons with payouts of 6x, 20x, and 200x your line bet for sets of 3, 4, and 5 symbols respectively. The wild card in the game does not pay, but it helps you form winning combinations by substituting other standard icons on the reels. It appears stacked on reels 2, 3, and 4 to increase your chances of winning, and your reward is doubled each time it contributes to a win. The scatter pays at any random position. It awards scatter bonuses worth 2x, 4x, 30x, or a massive 400x your total bet if you get 2, 3, 4, or 5 of these elements on the grid during a spin. One of the many things that will impress as you play Mad Mad Monkey casino slot online is the random free spins bonus. This feature is triggered by landing 3 or more scatters on the grid, and you start with 20 free games. During this round, all your wins are multiplied by 3, and whenever the Wild appears in a winning line, your payback is multiplied by 6 times. The banana also appears stacked during this feature, and this makes the free spins even more lucrative. You can get an additional 10 free games if you land the three or more scatters again during the free spins. 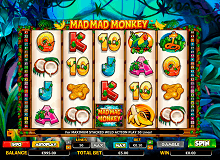 Mad Mad Monkey is an immersive game that guarantees maximum entertainment and the potential to win big time. The volatility of the slot is mostly low and you’ll find that the winnings in the base game are regular but relatively low. However, the big rewards come during the free spins round where you’re awarded special multipliers for each win, and this is the round to look out for. Players can also take advantage of the gamble feature to increase your money twofold or four times if you guess the colour or suit of a face-down card correctly. You can play Mad Mad Monkey for free online to discover more of its treats and tricks.